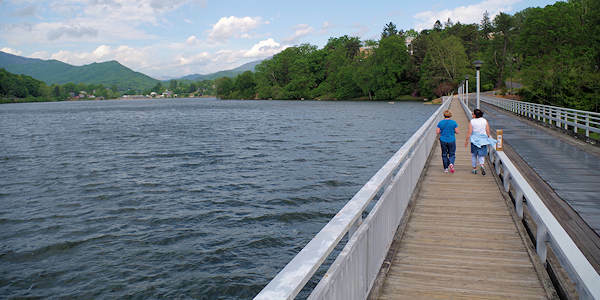 Our top accessible, paved hiking trail near Asheville is the Lake Junaluska walking trail around the beautiful lake at the United Methodist Conference and Retreat Center. They welcome everyone to walk the 2.3-mile loop (or the extended 3.8-mile option) by many interesting manmade and natural sights along the way. The trail is wheelchair, stroller and scooter friend. It's mostly flat with one hilly, wooded section. Since there are many places to park along the trail, you can enjoy a short stroll or the entire loop. 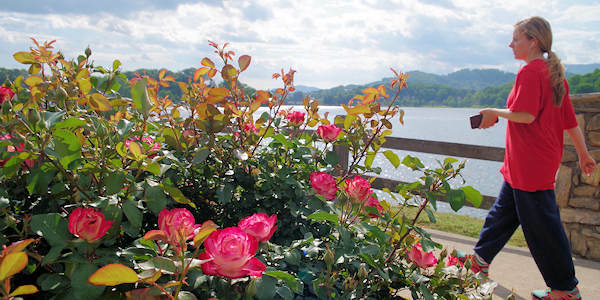 We suggest parking along the Rose Walk section near the World Methodist Museum (GPS: 575 N Lakeshore Dr, Lake Junaluska). A gorgeous spot to rest after your walk. Stroll by 200+ rose bushes and stop to smell them! Walk by the 1949 stone Memorial Chapel and peek inside. Next to the chapel is a labyrinth for a meditative walk. Along the rest of the trail, pass many historic buildings used at the retreat center, including several hotels. The highlight is walking the Turbeville Footbridge and walking across the dam (pic above). Take a short detour to Lambuth Inn and climb the hill to Inspiration Point for the best view of the lake and mountains. Or tour the World Methodist Museum. The Francis Asbury Trail (the wooded section) is the oldest part of the walking trail. Built around 1930, it is named for Bishop Francis Asbury, the “Prophet of the Long Road" and one of the pioneering American Methodist ministers who passed through this area in 1810. This section features a serene waterfall, several resting points and a gazebo. The longer 3.8-mile option extends the walk by the highway and takes you by the Bethea Welcome Center and other addition sites. 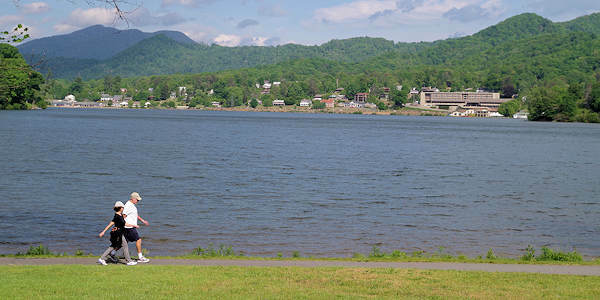 In fact, the Welcome Center (91 North Lakeshore Drive Lake Junaluska) is a great first stop to pick up a map and see what is happening on the day you visit - including dining options. Along the way, other detours include garden areas. 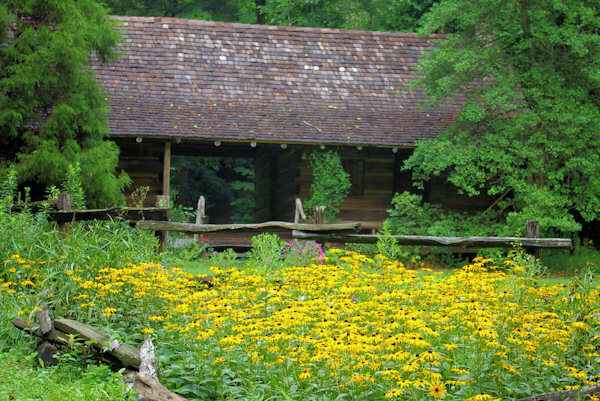 Stroll through the lush Corneille Bryan Native Garden with more than 500 species of native plants and is a haven for birdlife. The Biblical Garden at the Bethea Welcome Center features plants mentioned in the Bible, including herbs, figs, pomegranates, and vines. If you are looking for a place to ride your bicycle, the nearby Waynesville Greenway follows Richland Creek for 5.3 miles. Dining options includes buffet-style dining year-round at The Terrace hotel and Lambuth Inn. The Lake Junaluska Bookstore & Cafe in the Harrell Center offers specialty coffee, hand-dipped ice cream, smoothies, snacks, gifts, books, fair-trade products and souvenirs. During the summer, stop by the Lake Junaluska Soda Shop for snacks and recreation equipment rentals. Trail Map: Download a PDF of the walking trails map with points of interest. 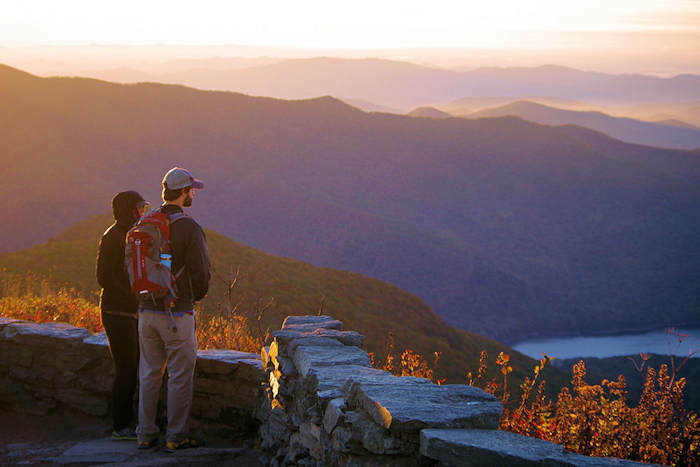 Directions: It's a quick 25-mile drive from Asheville. 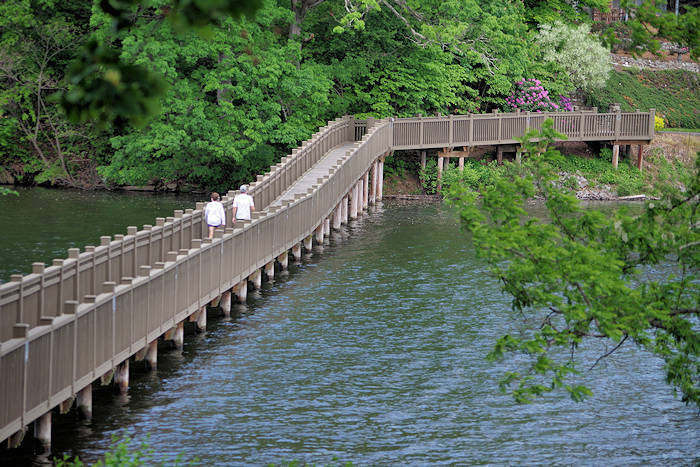 For more info, go to our Lake Junaluska Guide. 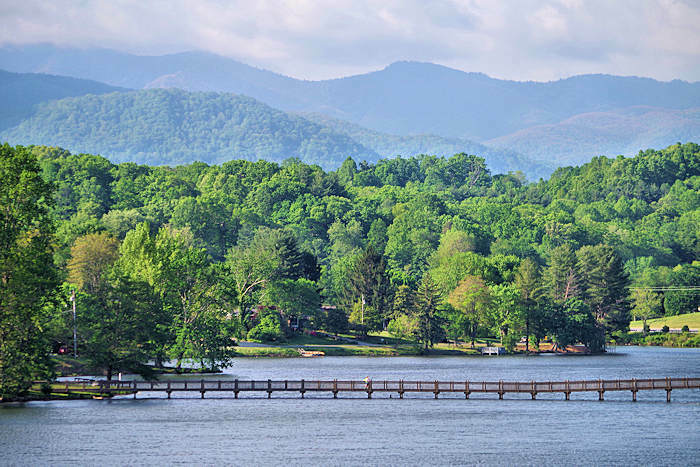 Stay by the lake with Smoky Mountain views Dec 1-March 31 and get 15% off. Near Waynesville & Maggie Valley. New reservations only, cannot combine with other discounts & not available for groups. Call 1-800-222-4930 to reserve & use code "ROM15".